Shell smooth, thick-walled, urceolate, with obliterated collar stricture. Length of the two joints= 5:12, breadth= 4:10. Cephalis campanulate, with numerous oblique pore-canals. 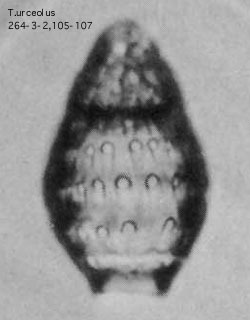 Thorax inflate, with five or six transverse rows of roundish pores of equal size. Mouth constricted, nearly half as broad as the thorax, with a broad hyaline peristome. Dimensions: Cephalis 0.05 long, 0.04 broad; thorax 0.12 long, 0.1 broad.